Invasive fungal infections constitute a major cause of morbidity and mortality in children undergoing therapy for hematological malignancies. We report a 1-year-old boy who was receiving chemotherapy for acute lymphoblastic leukemia. His clinical course was complicated by a clinical syndrome consistent with neutropenic enterocolitis to which he succumbed. 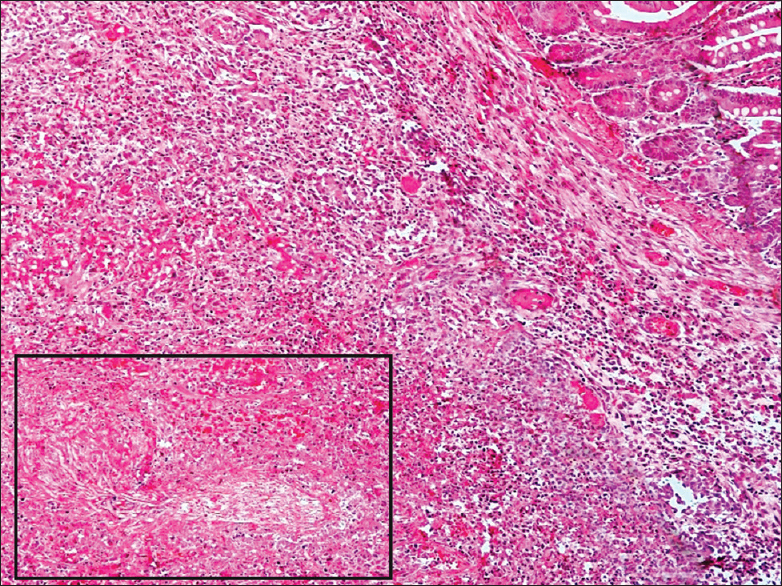 Histopathology of the surgically resected bowel revealed evidence of mucormycosis. Gastrointestinal mucormycosis is an unusual presentation which requires high degree of clinical suspicion and aggressive management. Invasive fungal infections pose a major hurdle to the successful management of children with acute leukemia. 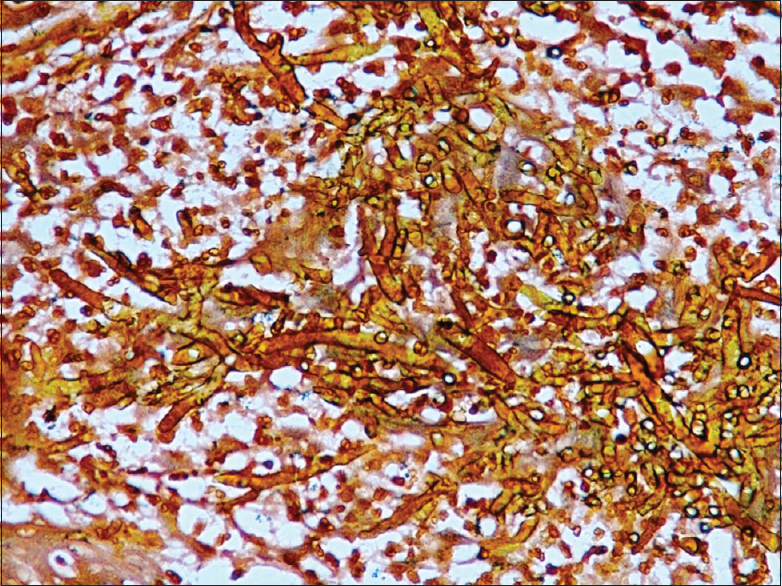 Although candidiasis and aspergillosis are the commonest pathogens, mucormycosis is emerging as a grave invasive fungal infection. Mucorales and Entomophthorales constitute the Zygomycetes class of fungi. The latter, however, largely affect immunocompetent hosts. 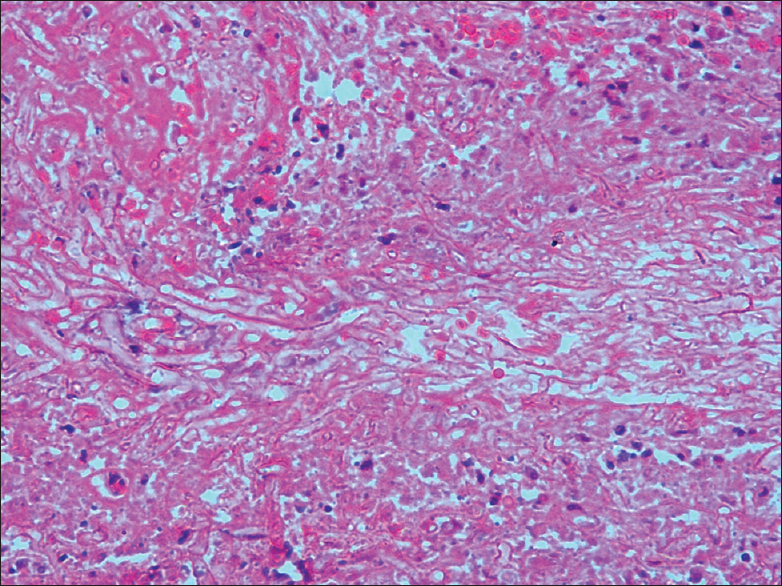 Pulmonary, followed by rhino-cerebral and cutaneous forms of mucormycosis are frequently encountered. Gastrointestinal mucormycosis is scarcely seen, and a challenge to manage. The clinico-radiological syndrome of gastrointestinal mucormycosis is akin to neutropenic enterocolitis. A 1-year-old boy diagnosed with precursor B acute lymphoblastic leukemia (ALL) was undergoing treatment under the high-risk arm of the Indian Childhood Collaborative Leukaemia Group protocol. He was admitted with febrile neutropenia during the consolidation phase of chemotherapy. Broad spectrum antibiotics were initiated with subsequent addition of liposomal amphotericin. The clinical condition deteriorated, with progressive abdominal distention and respiratory distress. A contrast-enhanced computerized tomography of the abdomen revealed massive ascites and evidence of pneumoperitoneum. An emergency laparotomy was performed. Adequate transfusional support was provided throughout the perioperative period. The peritoneal cavity was observed to be grossly contaminated with bowel contents. Two perforations were detected in the regions of the proximal ileum and mid-jejunum. The perforated segment of bowel was resected, followed by creation of a double bowel stoma. The peritoneal fluid grew multi-drug resistant (MDR) Klebsiella pneumoniae on bacterial culture which was sensitive only to colistin. Despite mechanical ventilation and inotropic support, the child succumbed to cardio-respiratory failure. Histopathological examination of the resected bowel segment demonstrated infiltration by aseptate hyphae with right angle branching, with a morphology consistent with zygomycosis [Figure 1], [Figure 2], [Figure 3]. Fever, abdominal pain, and neutropenia comprise the clinical triad of neutropenic enterocolitis (NEC). Chemotherapy-induced damage, further complicated by microbial translocation from the gut results in bowel wall inflammation and necrosis. Radiological evidence includes bowel wall thickening, predominantly in the ileocecal region., The clinical syndrome in the index case, coupled with the radiological evidence of pneumoperitoneum was consistent with the diagnosis of advanced NEC. Antimicrobial therapy is a vital component of therapy; with coverage targeting gut associated organisms, namely, Gram-negative bacteria, enterococci, and anaerobic organisms., Fungi such as candida, aspergillus, and mucormycosis can additionally contribute to NEC. In our case, there was histopathological evidence of mucormycosis in the resected bowel. In addition to the gastrointestinal mucormycosis, the ascitic fluid culture grew MDR Klebsiella, which could have further contributed to the fatal clinical course. Mucormycosis is emerging as an important pathogen with high lethality among patients with hematological malignancies and transplant recipients. The usual site of infection is pulmonary; other sites including, paranasal sinuses, brain, skin, and the gastrointestinal tract. Gastrointestinal mucormycosis is underrecognized due to its rarity, non-specific presentation, and overlapping manifestations with neutropenic enterocolitis., Gastrointestinal mucormycosis should be kept in mind while evaluating abdominal pain, gastrointestinal bleeding, alteration of bowel habits, and abdominal distention in a neutropenic patient. The stomach and intestine have been commonly involved in previously reported cases., Diagnosis is arduous, necessitating histopathology, or culture of germane specimens. Management encompasses administration of liposomal amphotericin, surgical debridement as well as control of the underlying condition. Surgery is often precluded by prevailing cytopenias. Despite surgery and antifungal therapy, mortality continues to exceed 50% in patients with hematological malignancies. Addressing predisposing factors may include cessation of ongoing immunosuppressive therapy and expediting reversal of neutropenia by utilizing granulocyte colony stimulating factors. Our case describes a rare infectious complication in children undergoing therapy for acute leukemia. In the age where survival of pediatric ALL has crossed 90%, it is vital to recognize such potentially lethal infections early, and institute appropriate measures for management. Skiada A, Lanternier F, Groll AH, Pagano L, Zimmerli S, Herbrecht R, et al. Diagnosis and treatment of mucormycosis in patients with hematological malignancies: Guidelines from the 3rd European Conference on Infections in Leukemia (ECIL 3). Haematologica 2013;98:492-504. Cornely OA, Arikan-Akdagli S, Dannaoui E, Groll AH, Lagrou K, Chakrabarti A, et al. ESCMID and ECMM joint clinical guidelines for the diagnosis and management of mucormycosis 2013. Clin Microbiol Infect 2014;20 Suppl 3:5-26. Dioverti MV, Cawcutt KA, Abidi M, Sohail MR, Walker RC, Osmon DR. Gastrointestinal mucormycosis in immunocompromised hosts. Mycoses 2015;58:714-8. McCarville MB, Adelman CS, Li C, Xiong X, Furman WL, Razzouk BI, et al. Typhlitis in childhood cancer. Cancer 2005;104:380-7. Portugal R, Nucci M. Typhlitis (neutropenic enterocolitis) in patients with acute leukemia: A review. Expert Rev Hematol 2017;10:169-74. Radhakrishnan N, Yadav SP, Oberoi J, Kulshreshta R, Bhalla S, Sachdeva A. Intestinal mucormycosis: A rare entity in pediatric oncology. Pediatr Hematol Oncol 2013;30:178-83. Tissot F, Agrawal S, Pagano L, Petrikkos G, Groll AH, Skiada A, et al. ECIL-6 guidelines for the treatment of invasive candidiasis, aspergillosis and mucormycosis in leukemia and hematopoietic stem cell transplant patients. Haematologica 2017;102:433-44.